Five years ago today, on June 4, 2008, disability rights activist Harriet McBryde Johnson died unexpectedly at her home in South Carolina at age 50. With today’s 24/7 news cycle and a deluge of information each morning when we turn on our computers, is it easy to forget to stop and remember people no longer with us. Harriet McBryde Johnson is worth remembering. McBryde Johnson made an enormous impact during a life that was too short, and her legacy continues in ways large and small. She didn’t live to finally see Jerry Lewis’ departure as hurtful spokesperson for the MDA, but she certainly had a hand in making it happen. And she was an early member of a loose affiliation of disability rights lawyer that has in the past five years grown into the vibrant Disability Rights Bar Association. We also know with certainty that if she were alive today, Harriet would be on the forefront of fighting for United States ratification of the United Nations Convention on the Rights of Persons with Disabilities (CRPD). She’d be applauding the recent UN ruling that the CRPD required Talking ATMs in Hungary, and she’d be shaming Republic Senators here at home whose lies and right-wing politics blocked CRPD passage last December. 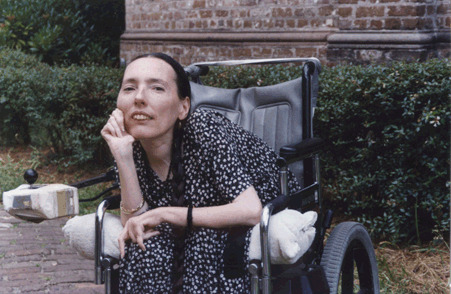 Most importantly, five years after her untimely death, McBryde Johnson’s activism and writings, her commitment to social justice, and her willingness to confront bigotry wherever she found it, serves as a continuing reminder of the core values and goals of today’s disability civil rights movement. the New York Times Obituary of Harriet McBryde Johnson. a Simplified Summary of this Document, a feature of LFLegal.com designed to meet WCAG Success Criteria 3.1.5 (a WCAG 2.0 AAA Reading Level requirement). Harriet McBryde Johnson died at home in South Carolina on June 3, 2008. She was a beloved disability and human rights activist. The world has lost a passionate and dedicated advocate for social change. Untold numbers in the disability community and beyond have lost a caring friend and role model.